RWTH Aachen University (German: [ɛɐ̯veːteːˌhaː ˈʔaːxn̩]) or Rheinisch-Westfälische Technische Hochschule Aachen[Note 1] is a research university located in Aachen, North Rhine-Westphalia, Germany. With more than 42,000 students enrolled in 144 study programs, it is the largest technical university in Germany. On 25 January 1858, prince Frederick William of Prussia (later German emperor), was given a donation of 5,000 talers from the Aachener und Münchener Feuer-Versicherungs-Gesellschaft, the precursor of the AachenMünchener insurance company, for charity. In March, the prince chose to use the donation to found the first Prussian institute of technology somewhere in the Rhine province. The seat of the institution remained undecided over years; while the prince initially favored Koblenz, the cities of Aachen, Bonn, Cologne and Düsseldorf also applied, with Aachen and Cologne being the main competitors. Aachen finally won with a financing concept backed by the insurance company and by local banks. Groundbreaking for the new Polytechnikum took place on 15 May 1865 and lectures started during the Franco-Prussian War on 10 October 1870 with 223 students and 32 teachers. The new institution had as its primary purpose the education of engineers, especially for the mining industry in the Ruhr area; there were schools of chemistry, electrical and mechanical engineering as well as an introductory general school that taught mathematics and natural sciences and some social sciences. The unclear position of the new Prussian polytechnika (which officially were not universities) affected the first years. Polytechnics lacked prestige in society and the number of students decreased. This began to change in 1880 when the early RWTH, amongst others, was reorganized as a Royal Technical University, gained a seat in the Prussian House of Lords and finally won the right to bestow Dr.-Ing. (1899) degrees and Dipl.-Ing. titles (introduced in 1902). In the same year, over 800 male students enrolled. In 1909 the first women were admitted and the artist August von Brandis succeeded Alexander Frenz at the Faculty of Architecture as a "professor of figure and landscape painting", Brandis became dean in 1929. While the (then no more royal) TH Aachen (Technische Hochschule Aachen) flourished in the 1920s with the introduction of more independent faculties, of several new institutes and of the general students' committee, the first signs of nationalist radicalization also became visible within the university. The Third Reich's Gleichschaltung of the TH in 1933 met with relatively low resistance from both students and faculty. Beginning in September 1933, Jewish and (alleged) Communist professors (and from 1937 on also students) were systematically persecuted and excluded from the university. Vacant Chairs were increasingly given to NSDAP party-members or sympathizers. The freedom of research and teaching became severely limited, and institutes important for the regime's plans were systematically established,[by whom?] and existing chairs promoted. Briefly closed in 1939, the TH continued courses in 1940, although with a low number of students. On 21 October 1944, when Aachen capitulated, more than 70% of all buildings of the university were destroyed or heavily damaged. In 2007, RWTH Aachen was chosen as one of nine German Universities of Excellence for its future concept RWTH 2020: Meeting Global Challenges, earning it the connotation of being an elite university. However, although the list of universities honored for their future concepts mostly consists of large and already respected institutions, the Federal Ministry of Education and Research claimed that the initiative aimed at promoting universities with a dedicated future concept so they could continue researching on an international level. Having won funds in all three lines of funding, the process brought RWTH Aachen University an additional total funding of € 180 million from 2007–2011. The other two lines of funding were graduate schools, where the Aachen Institute for Advanced Study in Computational Engineering Science received funding and so-called "clusters of excellence", where RWTH Aachen managed to win funding for the three clusters: Ultra High-Speed Mobile Information and Communication (UMIC), Integrative Production Technology for High-wage Countries and Tailor-Made Fuels from Biomass (TMFB). RWTH Aachen University's 620 acres (2.5 km2) campus is located in the north-western part of the city Aachen. There are two core areas – midtown and Melaten district. The Main Building, SuperC student's center and the Kármán Hall are 500 m away from the city centre with the Aachen Cathedral, the Audimax (biggest lecture hall) and the main refectory are 200 m farther. Other points of interest include the university's botanical garden (Botanischer Garten Aachen). A new building, the so-called Central Auditorium for Research and Learning (CARL) was opened in 2017. It offers space for 4000 students and replaces Audimax as the largest lecture hall building. The name of the new central auditorium, which is going to contain different lecture halls, is a reference to Charlemagne, who reigned his empire from Aachen in the middle-age. 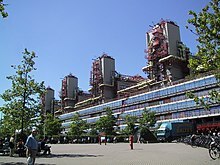 On the national level, two prominent German newspapers, “Handelsblatt“ and “Wirtschaftswoche“, currently rank RWTH Aachen the first place in Germany in the fields of mechanical engineering (including chemical engineering), electrical engineering, industrial engineering, and computer science. The RWTH School of Business and Economics is ranked amongst top 10 within Germany. In the latest ranking published by DAAD together with Centre for Higher Education Development and Die Zeit, RWTH Aachen also stands on top among other German universities in the aforementioned fields of engineering and computer science. Internationally, in the 2016 QS Faculty Rankings RWTH Aachen is placed 20 (Mechanical Engineering), 51-100 (Electrical Engineering), =40 (Physics & Astronomy), 36 (Chemical Engineering), 21 (Materials Science), =42 (Chemistry), =26 (Mineral and Mining Engineering. In the 2016 The Times Higher Education Subject Rankings; 29 (Engineering and Technology), 49 (Physical Sciences), 29 (Computer Science). Since February 24, 2011 study fees were abolished by the Landtag of North Rhine-Westphalia (Legislation for the Improvement of Equal Opportunities to University Admission) with effect from Winter Term 2011/12. Universities will receive 249 Mio Euro of national funding for measures that improve the quality of teaching (e.g., through additional teachers and tutors) as compensation. Tuition fees per semester are still being charged. The Aachen Institute for advanced study in Computational Engineering Science (AICES) is a graduate school established in 2006 under the German Universities Excellence Initiative at the RWTH Aachen University. Research at AICES is broadly in the area of Computational engineering, solving inverse problems that find applications in mathematics, computer science and engineering, mechanical engineering and natural sciences. AICES is a collaborative effort of 47 principal investigators from 8 academic divisions of RWTH Aachen University, as well as Max Planck Institute for Iron Research and Forschungszentrum Jülich. RWTH Aachen – North American Alumni Association: Prof. Dr. Burkhard Rauhut, former president of the RWTH, and Prof. Dr. Laszlo Baksay, President of the newly founded "Association of Alumni, Friends and Supporters of RWTH Aachen University in North-America" signed the founding statement for a new branch of the RWTH Alumni Community in Melbourne (Florida) in May 2006. Team Sonnenwagen Aachen Student team founded in late 2015 with the goal to develop and build solar cars for the World Solar Challenge in Australia. In 2017, the team participated for the first time in the challenge. RWTH Aachen University has educated several notable individuals, including some Nobel laureates in physics and chemistry. The scientists and alumni of the RWTH Aachen played a major role in chemistry, medicine, electrical, and mechanical engineering. For example, Nobel laureate Peter Debye received a degree in electrical engineering from RWTH Aachen and is known for the Debye model and Debye relaxation. Another example, Helmut Zahn and his team of the Institute for Textile Chemistry were the first who synthesised insulin in 1963 and they were nominated for Nobel Prize. Another example is B.J. Habibie, the third President of Indonesia that contributed in many aviation advancements. Franz Josef Och was the chief architect of Google Translate. ^ RWTH is the abbreviation of Rheinisch-Westfälische Technische Hochschule, which translates into "Rheinish-Westphalian Technical University". The institution is in Germany commonly referred to as RWTH Aachen or simply RWTH. The abbreviation remains untranslated in other languages to avoid the use of the Hochschule term, which is sometimes mistakenly translated as highschool. Sometimes, RWTH Aachen is also referred to as TH Aachen or Aachen University. ^ "Corporate Design". RWTH Aachen. Retrieved 2018-11-24. ^ a b c d "Facts and Figures". RWTH Aachen. Retrieved 2017-06-12. ^ Daten & Fakten – RWTH AACHEN UNIVERSITY – Deutsch. Rwth-aachen.de (2011-12-12). Retrieved on 2013-09-18. ^ "RWTH Aachen University". Times Higher Education (THE). ^ Figures by the German Federal Statistical Office (German; retrieved 2011-02-11). ^ "Excellence-initiative.com". excellence-initiative.com. Archived from the original on 2009-01-23. ^ Antje Wollenschläger. "IDEA League – IDEA League Home". Retrieved 21 July 2015. ^ Quinque, Venio (IMAG). "TU9 – TU9 Homepage". Retrieved 21 July 2015. ^ "DFG – Deutsche Forschungsgemeinschaft". Retrieved 21 July 2015. ^ "T.I.M.E. - Top Industrial Managers for Europe". Retrieved 21 July 2015. ^ "Spurensuche Ausstellung > Brandis". spurensuche-ausstellung.de. ^ a b c University, RWTH Aachen. "Facts and Figures – RWTH AACHEN UNIVERSITY – English". www.rwth-aachen.de. ^ "RWTH-Hörsaalzentrum C.A.R.L. : Noch im Oktober in den Probebetrieb". aachener-nachrichten.de. ^ University, RWTH Aachen. "Neues Hörsaalzentrum heißt C.A.R.L. - RWTH AACHEN UNIVERSITY – Deutsch". www.rwth-aachen.de. ^ "Research Funding at RWTH Aachen University" (PDF). eua.be. Archived from the original (PDF) on 2006-10-14. Retrieved 2008-08-07. ^ "RWTH Aachen University". 16 July 2015. ^ "CHE report" (PDF). che-ranking.de. ^ "Uni-Ranking: Deutschlands beste Universitäten – Campus & MBA – Erfolg – Wirtschaftswoche". Retrieved 21 July 2015. ^ (in German) Uni-Ranking 2011: Die besten Unis für die Karriere – Trends – Erfolg – Wirtschaftswoche. Wiwo.de (2011-04-19). Retrieved on 2013-09-18. ^ (in German) WiWo Rankings 2013. Wiwo.de (2013). Retrieved on 2013-12-14. ^ "QS World University Rankings by Subject 2013 – Engineering – Mechanical, Aeronautical & Manufacturing". Top Universities. Retrieved 21 July 2015. ^ "QS World University Rankings by Faculty 2013 – Engineering and Technology". Top Universities. Retrieved 21 July 2015. ^ "Mass Customization". Prof. Frank Piller – RWTH Aachen TIM Group. Archived from the original on 27 August 2010. Retrieved 21 July 2015. ^ "Handelsblatt-Ranking Betriebswirtschaftslehre 2012 - Handelsblatt Online". tool.handelsblatt.com. Retrieved 2019-04-22. ^ DAAD – Deutscher Akademischer Austauschdienst. "Deutscher Akademischer Austauschdienst – DAAD – Deutscher Akademischer Austauschdienst". Retrieved 21 July 2015. ^ Subject Rankings for RWTH Aachen, QS World University Rankings, retrieved on 2014-03-06. ^ "Jülich Aachen Research Alliance (JARA)". rwth-aachen.de. Archived from the original on 2011-06-14. ^ "Error". Retrieved 21 July 2015. ^ RWTH Aachen University. "JARA-FAME". Retrieved 21 July 2015. ^ "Association of Indian Students in Aachen". Retrieved 21 July 2015. ^ "Association of Thai Students in Aachen". rwth-aachen.de. Archived from the original on 2007-05-21. ^ "MexAS – Über uns". Archived from the original on 25 April 2010. Retrieved 21 July 2015. ^ "Log into Facebook – Facebook". Facebook. Retrieved 21 July 2015. ^ "Fva.rwth-aachen.de". rwth-aachen.de. Archived from the original on 2007-06-12. Wikimedia Commons has media related to RWTH Aachen University.